Katie is a dedicated, hardworking individual who is always willing to go above and beyond expectations to ensure that she delivers exceptional standards of service, both to her clients and candidates. 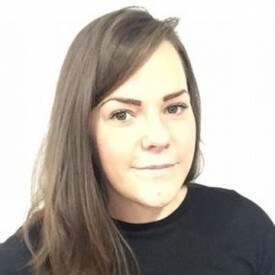 Katie has great intuition and thoroughly matches candidates to the right opportunities ensuring that her interview to placement ratio is better than 2:1, and that her retention levels of candidates placed is one of the highest we have seen on the accounts Katie manages. Katie started with JHR in October 2015 and has worked extremely hard to achieve two promotions within her first 9 months, a timescale I am extremely proud of and I am pleased to say is an unprecedented achievement in the history of JHR, well done Katie! I am looking forward to seeing you continue to break records for many years to come. From my first interview with Jo and Davina I knew Jo Holdsworth Recruitment was the right company for me and I was delighted to join the team in October 2015. From my first day I had a clear progression path and was given the opportunity to account manage two high volume key accounts, I am pleased to have increased our performance with both clients through number of candidates placed combined with higher candidate retention rates. Working for Jo Holdsworth Recruitment has given me the ability to work with companies I feel passionate about recruiting for and to work in a professional, successful team who all support, praise and encourage each other to reach our personal and commercial goals. As well as the team one of the attractions in joining JHR was the transparent commission scheme and the opportunity to make great bonus on a consistent basis, following my promotions I have received two basic pay rises plus increased benefits and I have just been awarded two new clients which will increase my earning potential further, I am also about to attend a management training course with a view to taking a resourcer on to help service my accounts. JHR is an amazing place to work and I cannot thank Jo and Davina enough for the opportunity they have given me.